Simply words - but forceful and dynamic in their simplicity. His early life was marred by sadness with his mother and father both dying before he turned twenty-seven years old. Because of commitment of other family members and friends, he and his brother, Marvin, never lost heart. Larry knew that without hard work nothing could be accomplished. He was self-reliant, courageous, and a common sense person. He never asked "why me?" He never asked for a miracle or sympathy. NO - he simply acknowledged that whatever was to be would be and he espoused a spirit of hope that, God willing, things would work out for the best. He also had some important advice for all of us - both men and women. Be sure to have a colonoscopy test because if cancer is detected early it can be treated - whereas, if not detected early it is the second most deadly cancer disease. Larry's vitality for life was larger than his heart - and his wit and charm made him a friend for life. I first met Larry when he lived on Spruce Street here in town, just up the road from my brother and me. he was a member of the neighborhood club known as the "Happy Valley Gang" and if you can believe it, he was known as "Skippy" - a name he begged us to forget. In the last few years it has been reported by Bill Bedard and Jack Dunham that if you e-mailed him in Florida his new handle was "Scuffy." Was he thrifty or frugal? - Yes, indeed. Don Long says that when they worked together at R.J. Fisher Real Estate, if you went out to lunch and Larry was included he never had any money. When he was working for Duprey Trucking he was also working for R.J. Fisher part-time learning the real estate business and when he arrived late for a meeting with potential house customers, in order to look official he would borrow someone's white shirt. He often went to Florida to visit Roland and Harriet Fisher, his mentors in the real estate business, as well as his close friends. On one occasion when he got to Florida, despite he and Roland looking high and wide for a rental car - none were available. So he bought a new car - used it in Florida, drove it back to Vermont and sold it here in town for more than he paid for it in Florida. He was not known for speech-making - but he was eloquent because he was straight-forward and right to the point in his business dealings. 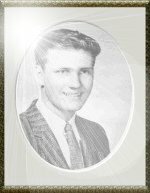 In his senior year at BUHS, Bill Bedard was elected President of the senior class and Larry was elected Vice President. Bill tells us that during that entire year Larry often told Bill that he was concerned that Bill was going to get sick or some other catastrophe would happen so that Larry would have to give the President's Address at graduation. Fortunately for Larry, Bill survived the year. Larry loved to buy, sell and improve real estate. In your business dealings wtih him you always knew where he stood and his word was his bond and the contract executed after the hand shake was merely a formality. He was especially pleased to help young couples have the opportunity to purchase their first home. He loved people and loved politics. An ardent Republican, he worked diligently for the Republican Party. Since he own some of the prime locations for political headquarters in downtown, I soon learned that if you wanted to rent any political space - Democrats need not apply. However, in the past few years he did admit that he did not mind Governor Dean riding in his antique convertible during a Brattleboro parade. In a nutshell, he was a man who came from the people, was one of the people and understood their hopes and aspirations. As a supporter of community events and projects, as was stated in his obituary, he worked tirelessly for many civic and town organizations. Not known by all, he was financially generous to charities and local organizations, except the Internal Revenue Service. When he purchased the Merchants Bank building on Main Street which houses the IRS he gleefully stated - "All my life annually, even quarterly, I have sent an income tax check to the IRS - can you believe it - now they are sending me a monthly rent check." It is fitting that we gather here a St. Michael's to pay tribute and say goodbye - for it is here in this Church that he worshipped as part of our Christian community. And so, as we take him to his rest, let us reflect and rejoice on how he affected our individual lives and to be thankful to God for him - a good and decent man, with a compassionate heart, a friend for all seasons, a man as Kipling said would walk with kings but never lose the common touch. To Kathy, Debbie, Liz, Jane and Sue and other family members, we thank you for sharing him with us. And where there's sadness, every joy. Make me a channel of your peace.